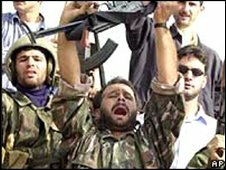 The military arm of Lebanese political party Hezbollah has been added to the government's list of organisations banned under the Terrorism Act 2000. It means it is now a criminal offence for anyone in the UK to be a member of the party's military structure, raise funds or encourage support for it. The ban does not apply to Hezbollah's political, social or humanitarian work. Hezbollah leader Hassan Nasrallah said the move was not a surprise from a country that helped create Israel. There are now 45 international organisations on the government's banned list. Hezbollah's external security organisation was already banned, but this has been extended to a ban on the party's entire military structure. Home Office minister Tony McNulty said what the government sees as the party's military wing was providing active support to militants in Iraq, including training in the use of deadly roadside bombs. "Hezbollah's military wing also provides support to Palestinian terrorist groups in the Occupied Palestinian Territories, such as Palestinian Islamic Jihad," he added. "It is because of this support for terrorism in Iraq and Occupied Palestinian Territories that the government has taken this action. "Proscription of Hezbollah's military wing will not affect the legitimate political, social and humanitarian role Hezbollah plays in Lebanon, but it sends out a clear message that we condemn its violence and support for terrorism." Mr Nasrallah said that the ban was "certainly not a surprise". He said: "Personally, I consider it a natural decision, coming from a country which founded the Zionist entity [Israel], a main partner in uprooting the Palestinian people and the creation of the usurping state of Israel."